This is my great grandmother's favourite sherbet recipe. She would have made this recipe for her family any time from the late 1800s through to the 1940s. It was passed down to me by her daughter, my great Aunt Hilda. In rural Nova Scotia at that time oranges and lemons were a exotic commodity. It would have had to have been a well loved recipe that sacrificed some of this uncommon ingredient. 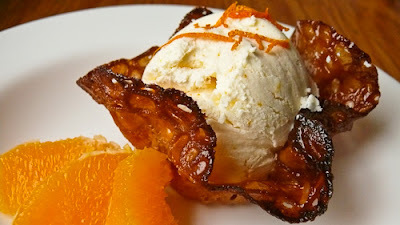 It's a gem of a recipe and doesn't require an ice cream freezer. All you need is a baking pan and the freezer compartment of your refrigerator. I am also including an option for making it in a crank freezer as well. We usually make ours in a Donvier hand crank ice cream maker, but my great grandmother would have beaten it by hand as the directions indicate. 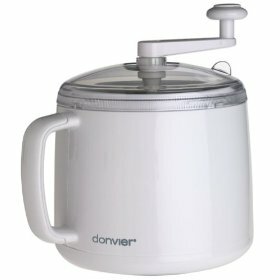 Donvier hand crank ice cream maker. If using a machine, beat the egg with the sugar until thick. Add the sugar to the juice and rind. Mix well until dissolved. Then add in the whipping cream. Beat slightly and then add the cereal cream. If using the refrigerator freezer: Pour the mixture into a baking dish and place in the freezer. As it freezes, beat occasionally. Beat the mixture several times in this way until it becomes stiff. You do not want it to freeze in a solid mass, but to be light and fluffy. If using an ice cream maker: Pour liquid into the container and churn until the desired thickness. Scoop sherbet out and place in a container in the freezer to store.